The name or signature to be printed on the attached flower card. The message to be printed on the attached flower card. All arrangements are created by a preferred local florist that delivers to your selected location, whether that is the service location, Lakeshore Memorial Services, Inc. or the family home. For morning services, orders must be placed by 12pm in the recipient's time zone the previous business day. Orders are processed Monday through Saturday by local florists using local delivery methods. No deliveries will be made on Sundays. To ensure same-day delivery, the order must be placed before 11:00 a.m. EST Monday through Saturday (major holidays excluded). Orders for Monday morning delivery must be placed by 12 p.m. on Saturday. Please note that all prices are quoted in U.S. dollars. 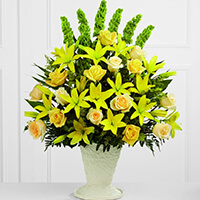 The FTD Golden Memories Arrangement bursts with sunlit beauty to honor the life of the deceased. 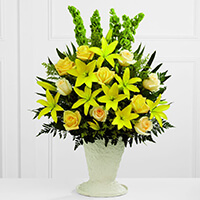 Brilliant yellow Asiatic lilies, roses and solidago are offset by cream roses, Bells of Ireland, teepee palm fronds and lush greens to create a dazzling display. Arranged in a large papier mache urn, this incredible presentation of floral grace will bring a cheerful elegance to their final farewell service. Once your online order is complete, your selected arrangement will be flagged so that others will know that this arrangement has already been selected. Why order flowers through us? 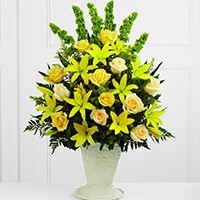 Ordering through the funeral home helps ensure your order will be placed through a local flower shop with whom the funeral home has a personal and trusting relationship with. Through this service, you will be able to leave a longer message of support to the family via a card with the picture of your selection that will be included with your thoughtful gesture. As well as a photo of your arrangement and message will remain in perpetuity within this memorial website. This service also includes “Smart Select” whereby we will alert you during the order process if your floral selection has already been selected by another sender, allowing you the opportunity to choose a different arrangement if you wish.